The Alpha War has begun. It's like the George Harrison song 'Here Comes The Sun'. Guy takes the first verse. John drinks some 'Night Nurse'. And the rest of the corps just wants to have fun. Funnily enough, these guys do too! Writer: Peter J. Tomasi; Artist: Fernando Pasarin; and Publisher: DC Comics in April 2012. Part two of 'Alpha War' is like sticking one of your private parts into a vat of deranged piranhas. It's just a matter of time before something drops off. Well, I am very sad to say that Green Lantern, John Stewart, has been arrested by the Alpha Lanterns, for a crime that the rest of the corps did not know he has committed - he killed a fellow corpsman to save the lives of millions. Granted, Lantern Gardner does try a number of things to get his pal out of this predicament. 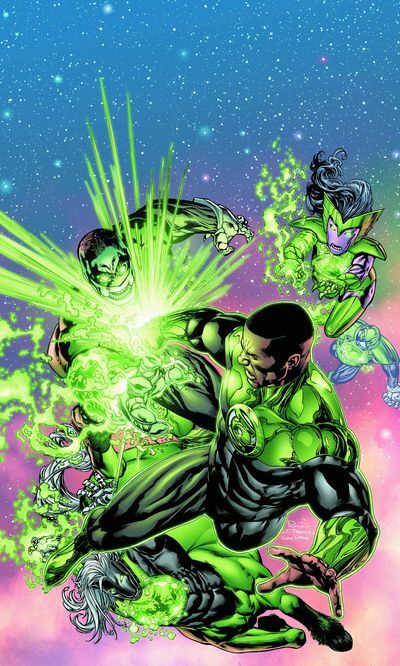 Like start a fight with the Alpha Lanterns. Speak to the Guardians. And stand-up for him at his trial. However, to be absolutely honest with you, things don't really turn out in the way that either Guy or John would have liked them to. In a very straight forward manner, my most favourite thing said in this story, is also a saying which sums up the underlining sentiment both John and Guy feel by issues-end. Who need highfalutin rhetoric when you have curse words of this calibre? Ha! Just the like the proceeding issue, this one has a tone to it which is just encompassing through-out. You know John is going to give himself up. You know that Guy is going to do his best to defend his friend. And you just know that it will all be for naught. However, what you don't know is that this was part of the Guardians plan all along. B*stards. Now this is a difficult question to answer really. Because the majority of this issue was just great. Though, if I had to pick something, I would have to choose that scene where Vath wanted to deface Kirrt's shrine. It felt like a tag-line to the previous scene where Guy and John confronted the Alpha Lanterns, and never seemed to go anywhere within the confines of this tale. STORY: There were a couple of little nice set-pieces in this comic book which gave the overall narrative a bit more scope. Of course I am referring to the segments where Guy is talking to John in his science-cell, where he explains to him how he felt and why he can associate with his predicament - by conveying a 'lost-tale' of his past. Well, I presume that this is a 'lost-tale' in part! Does anyone out in cyber-space know better? ART: When the Alpha Lanterns cast the image of John killing Kirrt in the sky, I very much enjoyed the preceding cross-paneled page where you got a look at the shocked expressions upon each of the Lanterns faces. Very cinematic in tone and personal in temperament. VATH: Now I was thinking for this pain in the lantern, we need an actor who has a face that screams 'I think that I know what I am doing'. 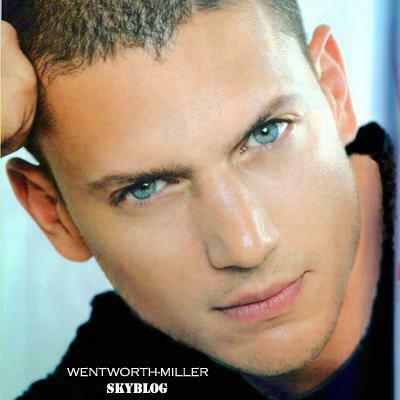 So what about Wentworth Miller from 'Prison Break' fame? He does 'thinking' very well. DASIM: OK, so for this trial lawyer, we don't really care what the actor looks like, because this ugly looking sod will be created in CGI. Rather, we want to know what he sounds like, right? So in my opinion we need a man who is very proficient at speaking in front of a gaggle of unruly people. Jerry Springer? Yeah. Why not. Certain Anti-Communist Countries Have Said In The Past "Better Off Dead Than Red". What Would Happen If you Swapped 'Red' for 'Green'? There was one thing that really did shock me while reading this issue, and that was the Guardians involvement in what is happening to the Green Lantern Corps. OK, I know that this is all gearing up to something soon. Both Hal and Kyle are up to their necks in it, in their books. And it seems so too are Guy and John here. Still, the question remains, are the Guardians villains now? Looks like it, huh?